DELICIOUS GREEN SUPERFOOD BLEND. Packed with essential organic greens, micronutrients, probiotics, and digestive enzymes to optimize your nutrition and detox your body. 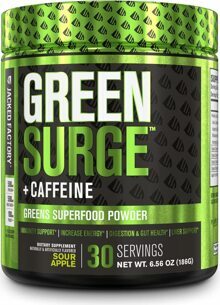 GREEN SURGE powdered greens (keto friendly) is made with organic plant super-foods that are rich in essential micro nutrients, probiotics, and digestive enzymes to nourish your gastrointestinal system with healthy bacteria. This green superfood juice mixes easily in water and comes in an amazing natural mixed berry flavor. ANTIOXIDANT & IMMUNE BOOSTING. Multiple servings of super foods, vegetables, and whole fruit powder in just one scoop to support overall health and help regulate oxidative stress. GREEN SURGE serves to support the immune system by providing a fruit and vegetable blend with unrivaled antioxidant capacity. Enhance your daily power smoothie! SUPPORT GUT HEALTH & DIGESTION. Our probiotic blend provides nourishes your gastrointestinal (gi) tract with the right organisms to optimize digestion, promote gut health, and improve nutrient absorption. Research in the 21st century is continually showing just how important healthy gut microbes are for protecting your gastrointestinal function. ENERGY & VITALITY. Promote overall health, vitality, and energy levels. 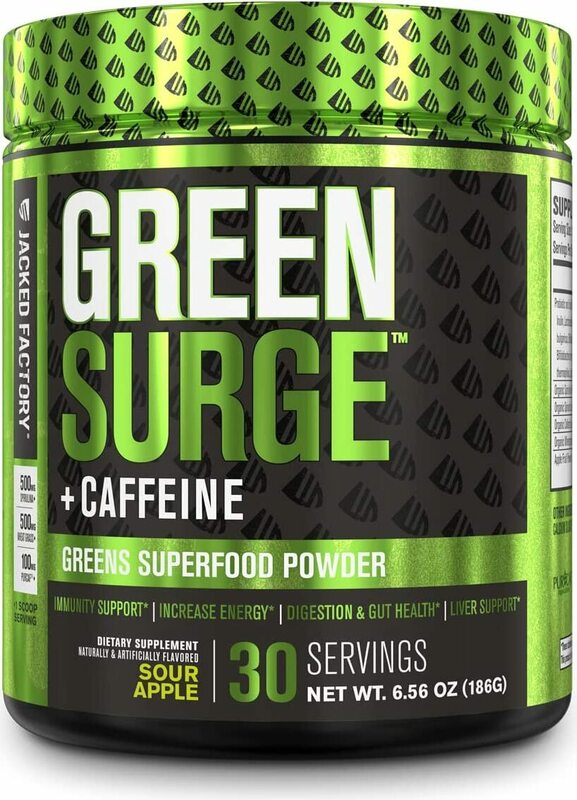 GREEN SURGE contains fiber, green tea extract, and grape seed extract which promote satiety, prevent cravings, and act as prebiotics for a healthy GI tract. In turn, this supports the immune system, energy throughout the day, and proper body function. USA MANUFACTURED IN A cGMP FACILITY. All Jacked Factory products are manufactured in a state-of-the-art cGMP facility in the USA using the strictest quality control guidelines. We guarantee that our customers are receiving the safest and highest quality supplements on the market. We take our customers’ health and results seriously, we will never sacrifice quality.